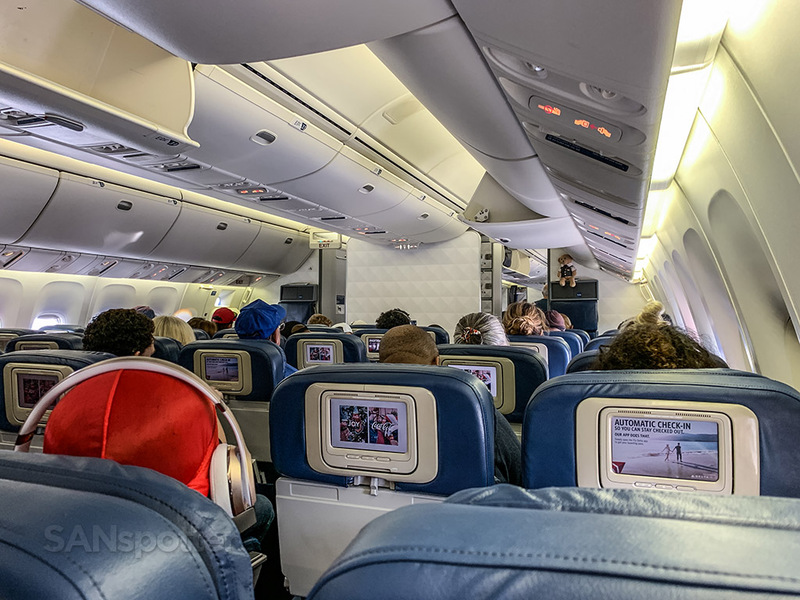 Remember the last time I wrote a Delta 767-400 economy review? 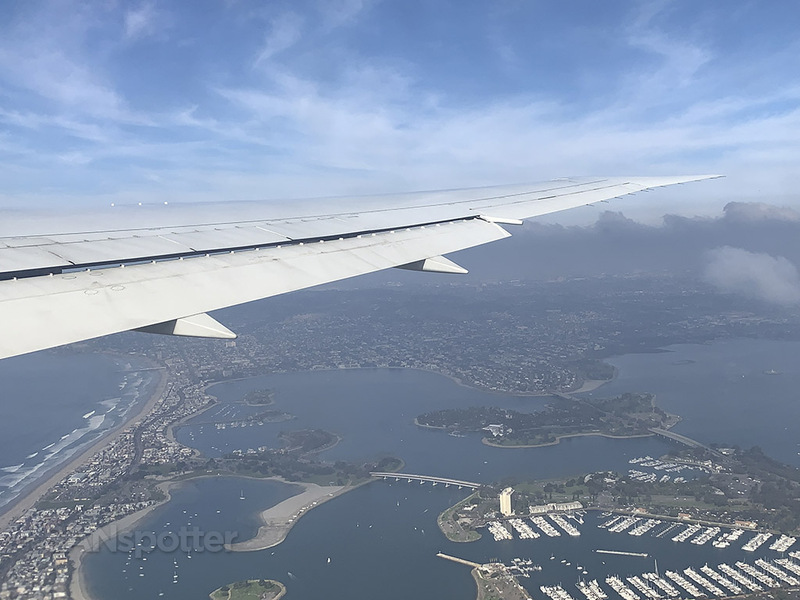 I mean a review about DL 767-400 economy class – not a super cheap blog post about a stretchy 767. Anyway, that was several years ago, and back then, I was disappointed that the interiors were dated and not anywhere up to current Delta standards. I had the opportunity to get another ride on one of these things exactly one month ago, and (spoiler alert) – they haven’t done a stinkin’ thing with these birds since the last time. They still feature 20 year old interiors with tiny video screens. There’s no mood lighting. And they even smell the same too. Oops. Did I give away too much in this introduction? Possibly. But if 20 year old aircraft interiors (which smell like diapers and stale coffee) are your thing, it behooves you to scroll down and check out the pics. Delta Air Lines 767-400ER side view illustration by norebbo.com. Seat map of this Delta Air Lines 767-400ER courtesy of seatguru.com) showing my seat (36G) for this flight to ATL. The video I created for this flight is an especially good one, especially because you’ll get to see how difficult is for me to walk into the airport with *two* full size suitcases. How often does that happen? Just how rare is the Delta 767-400 at SAN? 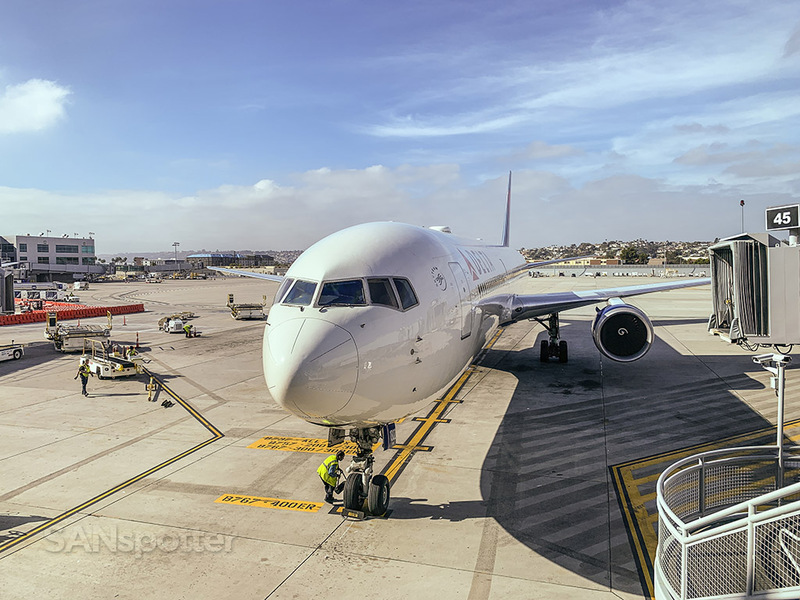 Those of you familiar with the San Diego International Airport will know that the Delta 767-400 is rare here. Like Great White Elk rare. It shows up every now and then, but for the most part, I could probably count the number of times it’s been here on all of my fingers and toes. 99.9% of the passengers on this flight today have no clue how lucky they are to be flying on a 767-400ER to ATL. Or, maybe that 0.1% (me) cares too much about the little things and its a meaningless statistic. Most of the times that it’s been here have been during the holiday season for the past two years. 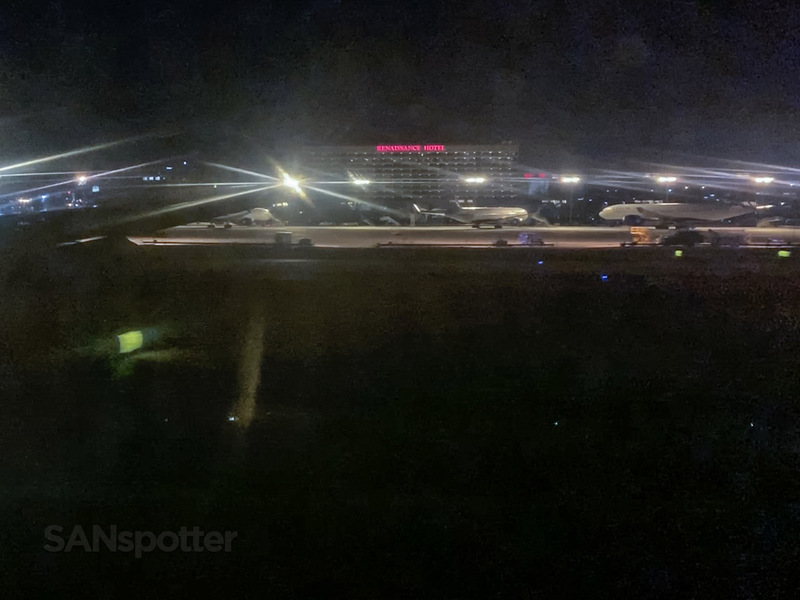 It seems that Delta has some spare 767-400s sitting around at that time, and they’ve been generous enough to send one to San Diego to replace an existing aircraft on the Atlanta to San Diego run. It usually shows up a couple days before Christmas, and then flies away for good just after the start of the new year. It was brief, but fun! 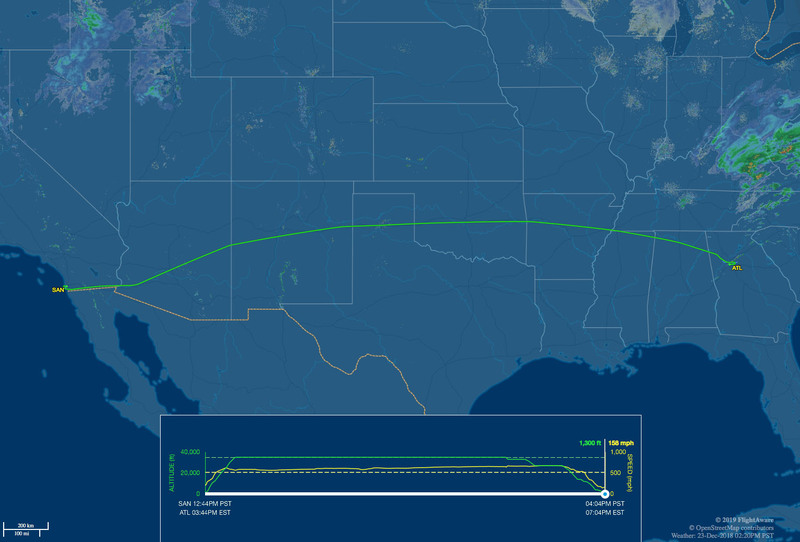 Here’s a screenshot from flightaware.com showing how short-lived the Delta 767-400 was between ATL and SAN. Being that my wife and I needed to fly to Florida to visit my family for Christmas, hitching a ride on the stretchy 767 fit into our plans perfectly. What wasn’t so perfect was the fact that this Christmas trip to visit family meant that I had to step a bit out of my comfort zone and travel with two very large suitcases that would need to be checked. Walking into an airport pushing a large suitcase towards the check in counters is totally out of my comfort zone. I’m surprised I didn’t get lost on the way. Interesting. Nobody seems shocked to see SANspotter arrive tripping over his own luggage. Looks like business as usual here at the Delta counters! 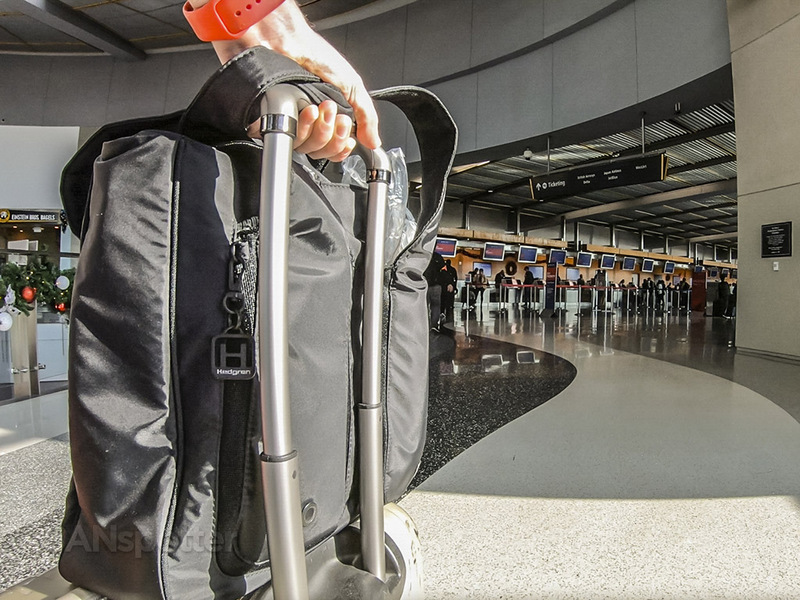 Most of you know that I normally travel with nothing but my trusty (and small) black North Face backpack, so having to yank around two big heavy suitcases was a challenge. I would definitely not enjoy traveling so much if I had to do this all the time. Not only was traveling with two large suitcases a somewhat different sensation for me, having a travel companion was interesting as well. That meant instead of running to the windows like an eight-year-old to check out every cool airplane that I saw, I had to do more “adult” things such as standing in line for Starbucks coffee and finding a quiet place to sit that wasn’t in the sun. It also had to be within close proximity to our gate. If it wasn’t for my wife, I would never have these opportunities to act like an adult. 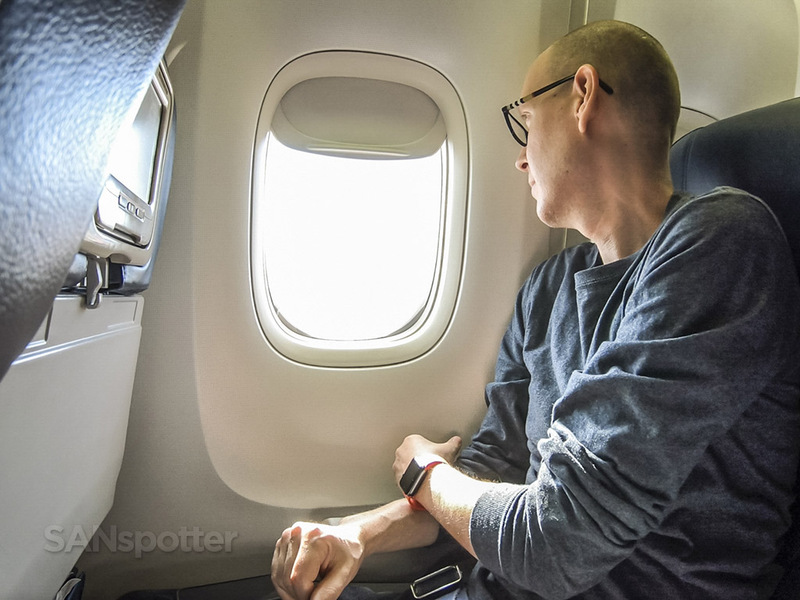 You should have seen the confused look on my wife’s face when I handed her my phone and said “I need a picture of me looking out the window trying to look cool.” Has she not been reading my trip reports lately?! Phil’s BBQ and a Delta 767-400 in the same pic. Surely there’s never been a better trip report pic. Ever. Boarding for this flight to Atlanta was delayed a bit, which was starting to make me nervous because we had a very tight connection. Zone 5 life. However, being one of the last to board the plane didn’t matter all that much to me. Our tight connection at ATL was the only thing on my mind, and I must have looked like a total goofball standing there with such a concerned expression on my face. 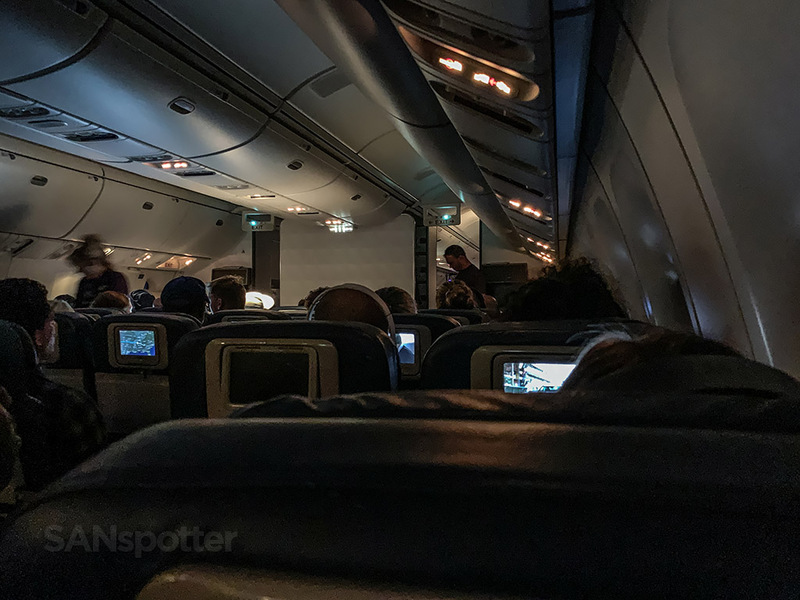 Considering that it was two days before Christmas, missing our connection had the potential to be disastrous with every other flight being packed solid. It’s times like this where I mentally force myself to stop looking at my watch, because well…ignorance is bliss. Coincidentally enough, it was at exactly this moment when a visibly frustrated guy walked right by me muttering “GOD I HATE AIRPORTS” under his breath. Amen brother. 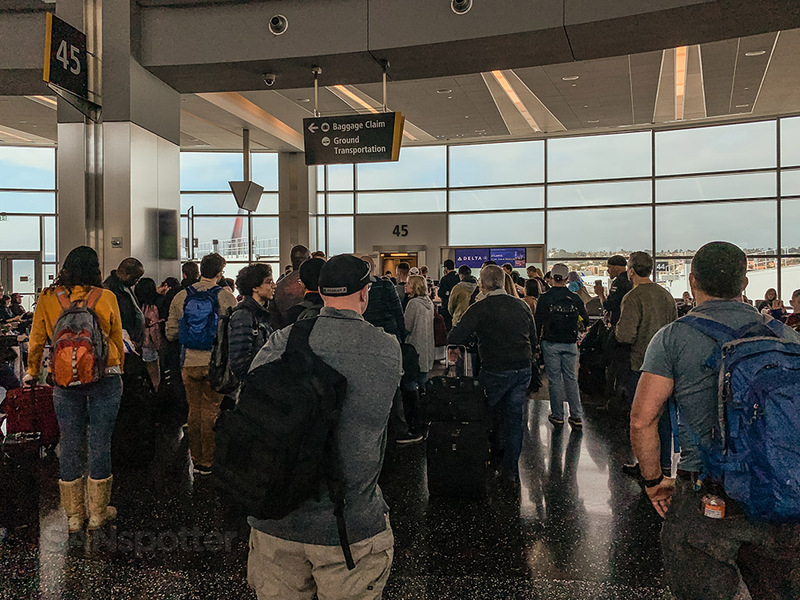 Our delay grew longer as the boarding process continued, and I was starting to get the feeling that we were screwed once the pilot made an announcement that they were still waiting on some paperwork. “Sorry folks but it’s going to be about another 10 to 15 minutes”, he said with a cool and collected southern drawl. However, the experienced traveler in me knew that “10 to 15 minutes” really meant 25 to 30. At least. There was no way that we were we were going to make our connection in Atlanta now. Quite possibly the oldest interior of the entire Delta fleet? I had lots of time to think about it as they got the paperwork in order. 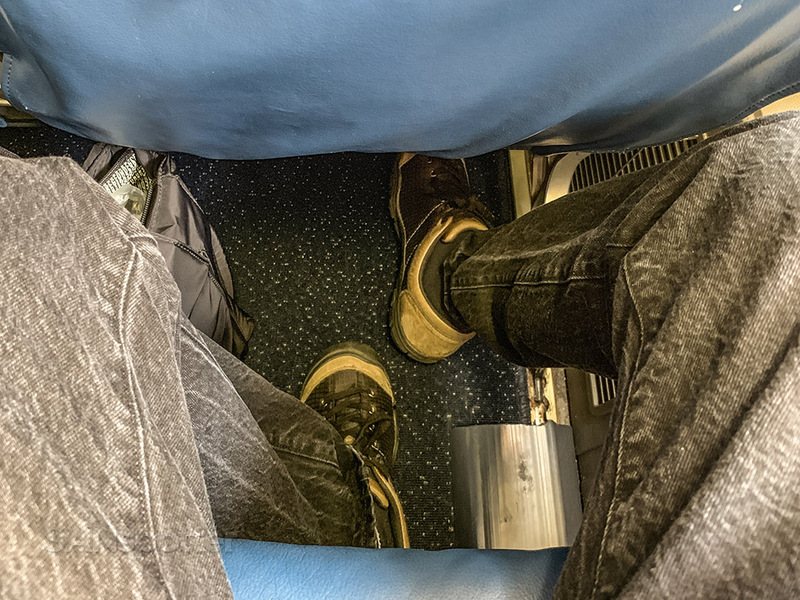 Leg room is just so-so on these 767-400s. Didn’t matter though. All I could think about was that “GOD I HATE AIRPORTS” guy with hopes that he wasn’t on this plane. He would’ve snapped by now I’m sure. I was so proud of my wife when she proactively told me to look out the window as she took my pic. She may not understand trip reports, but this is a sign that she’s coming around. “It won’t ****ing fit in these old ****ing bins!” is a more realistic caption for this. We may be late, but we’re coming for you Atlanta! Buzzing Mission Bay. I wonder if there was anyone down there who yelled “holy crap it’s a 767-400!” as we flew overhead? Probably not, because nobody could possibly be that nerdy. Good news came about 10 minutes after departure when the pilot made another announcement that flying time would be a very short three hours and nineteen minutes. 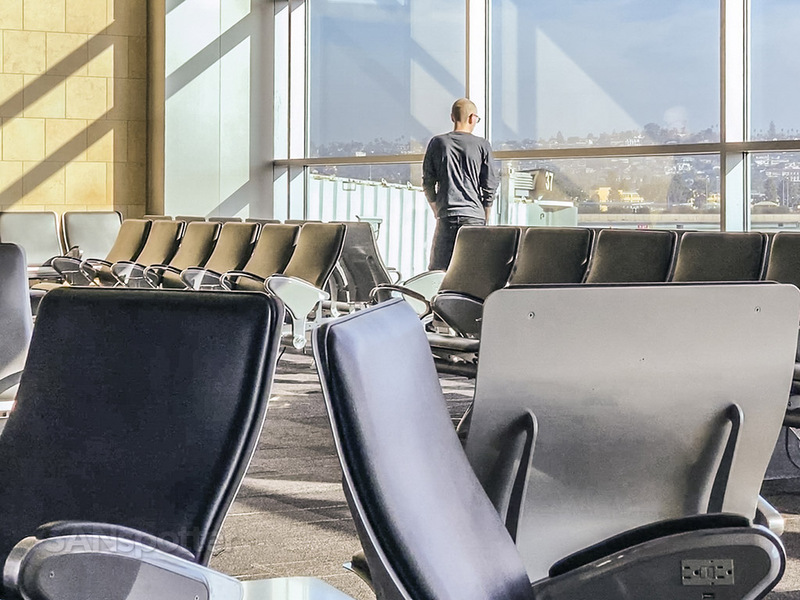 If that were to be true, it would give us approximately 45 minutes to make the connection – which seemed entirely plausible even at a busy airport such as ATL. It goes without saying that I had consumed my usual (ritualistic?) Healthwhich at SAN prior to this flight, so I wasn’t starving or anything. My wife wasn’t hungry either, which is never a surprise because she’s never hungry anyway. It’s weird and I don’t get it. 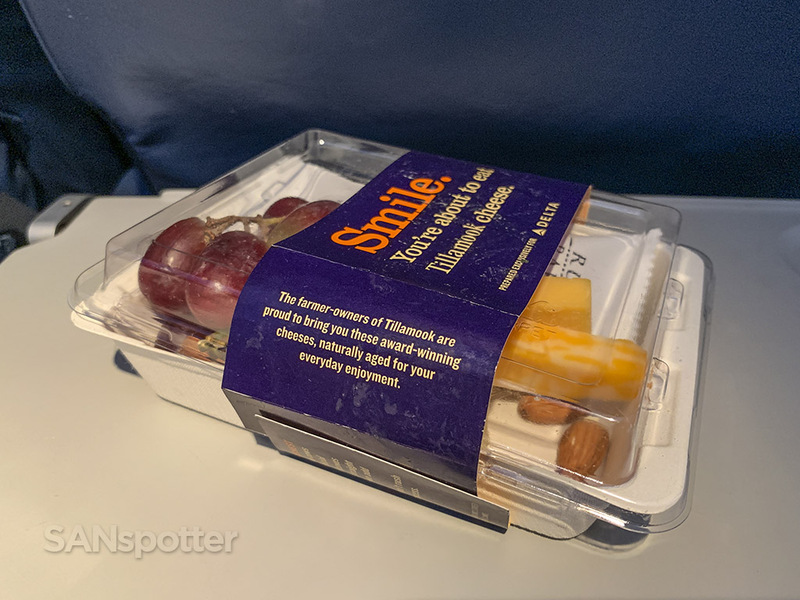 Despite the lack of a grumbling stomach, I couldn’t resist the opportunity to order up one of those nine-dollar fruit and cheese plates. 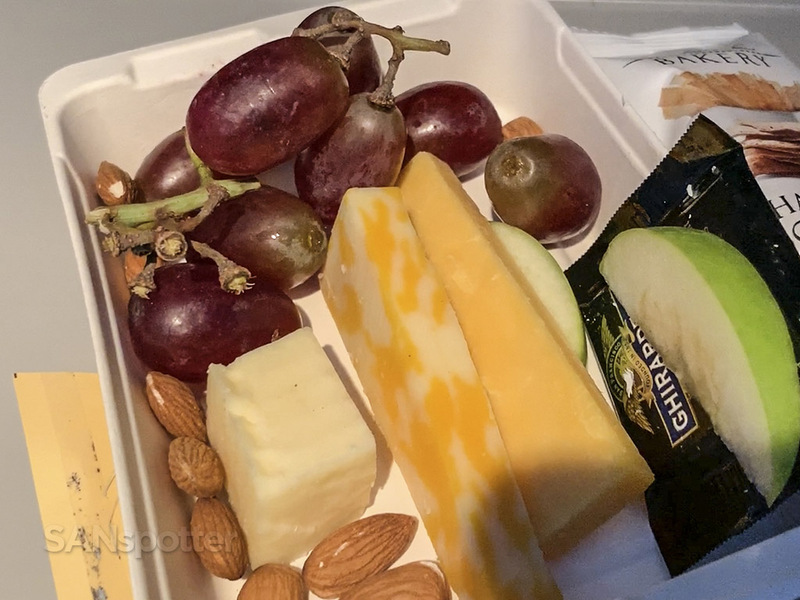 Considering that Air Canada only served cheese and crackers on my two most recent flights (LAX-YYZ and YUL-YVR), I was felt as I was living the high life with this box of goodies sitting in front of me. At a cost of $9 though, it’s hard not to wince with every bite. It was pure robbery, I know, but…it’s good trip report footage, right? I don’t know about you, but is cheese not the perfect airplane food? It’s easy to eat, it’s finger friendly, and it won’t emit a stench that’ll make everybody in close proximity gag. The only problem is that I’m still just a poor travel blogger who can’t afford this kind of stuff, so it probably behooves me to stop wasting my money like this. However, I chalked this one up as “trip report content” and ate it with a smile knowing that this review was going to be that much better for it. 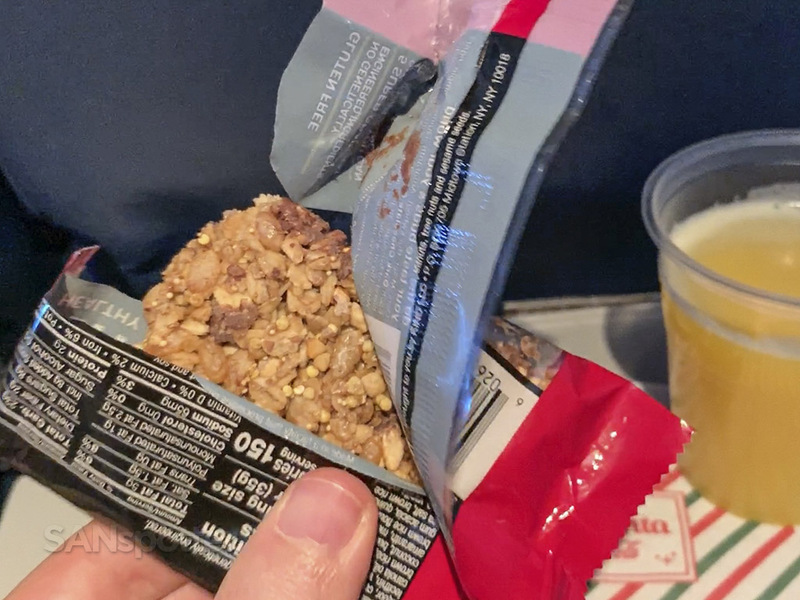 Delta also offers complementary snacks and drinks, so it’s not necessary to purchase food if you just want something to nibble on. The granola bar and orange juice I didn’t have to pay for. The sugar high was tremendous btw. They were offering Biscoff cookies, pretzels, and granola bars on this flight, and they were more than generous to give my wife one of each when she couldn’t decide which one to go for. Let that be a lesson for anyone feeling hungry. The Delta 767-400 economy class cabin. Does anyone have a guitar I could borrow? I tried not to think about the possibility of missing our next flight as I focused my attention on getting really good sunset footage for the video and this written review instead. It was kind of like how the dentist uses really cheesy posters on the ceiling as a distraction while coming at you with industrial-strength power tools. Almost there now. Only one more hour to go before running like hell across ATL in a way that can’t be described any other way but “embarrassing”. If only we would have arrived into Atlanta under this light. Travel blogging isn’t fair sometimes! 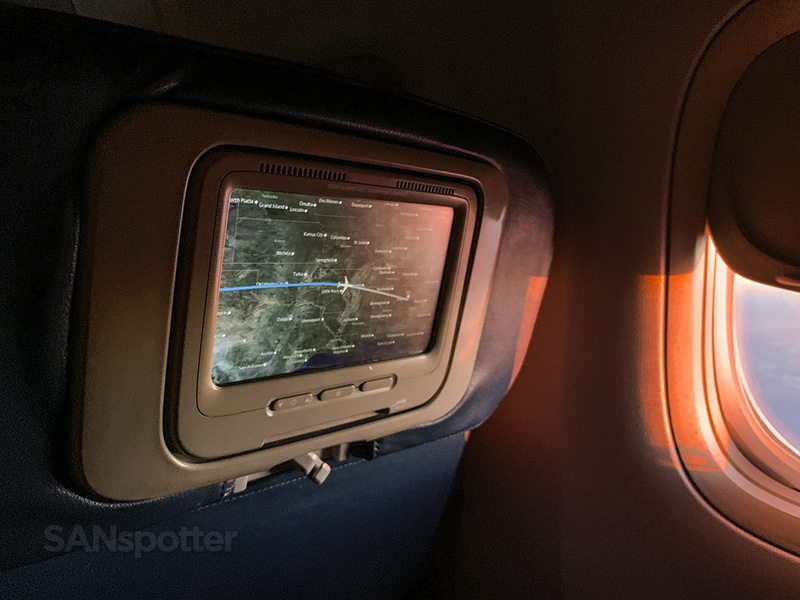 This plane deserves mood lighting. Just sayin’. The approach into ATL was under complete darkness unfortunately, so there wasn’t much to see on the way in. I was quite proud of myself for not looking at my watch though, because no good could have come from that. Normally I’m not so worried about missing a connection, but with this being Christmas and all, I wasn’t looking forward to the possibility of driving the rest of the way down to Florida. Is it ok to admit that I’ve never once stayed at the Renaissance hotel here at ATL? I sort of feel like one can’t become a true AvGeek until that happens. Immediately after touchdown, a flight attendant made an announcement that we would be arriving at terminal F. Our flight down to West Palm Beach would be departing out of terminal A. Ouch. Get ready to run! Tensions were high as soon as the seat belt sign turned off. 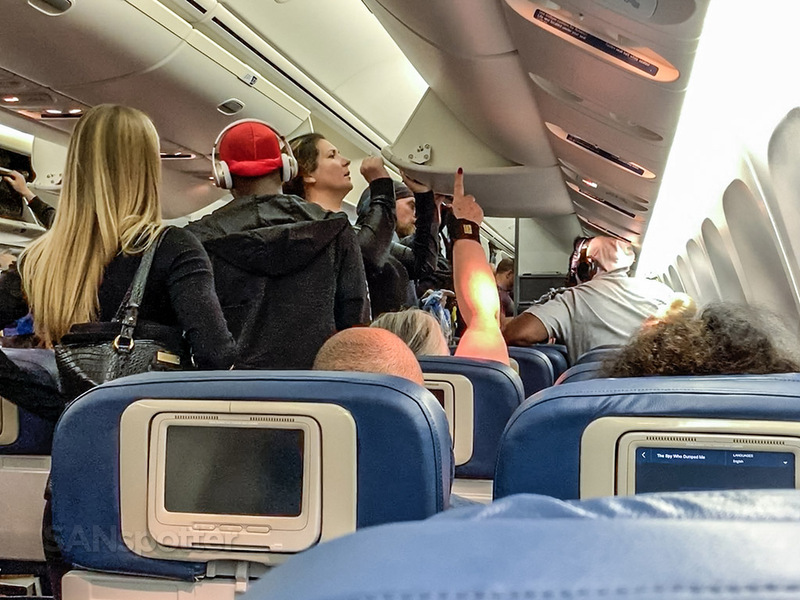 Many on this flight were in danger of missing their onward connections, and it’s surprising that nobody lost an eye on the way out. Considering that we had less than 35 minutes to make our connection, I wasn’t feeling very optimistic. My wife was the total trooper though, because she was determined that we could do it and we hit the ground running as soon as we stepped off the plane. I had no say in the matter. 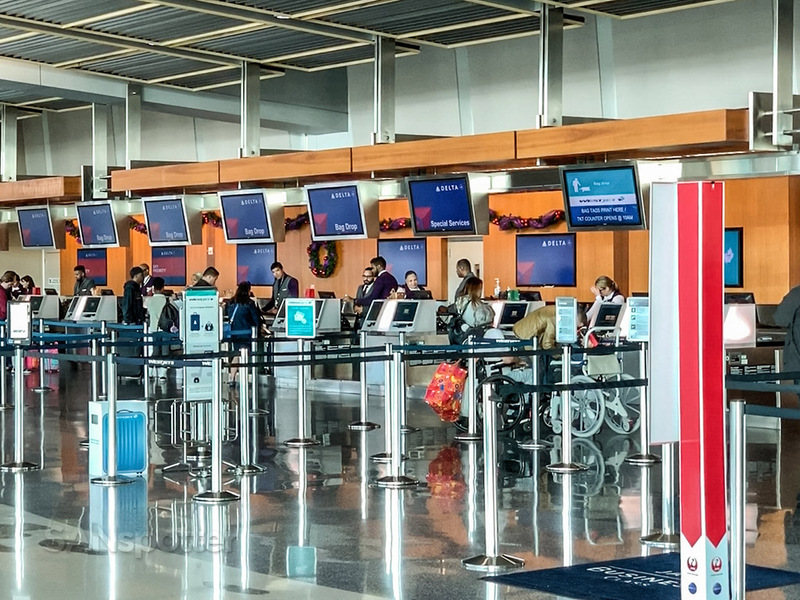 It should be noted that Delta had already rebooked us on the next flight down to West Palm Beach that evening, which just so happened to be departing two hours later. 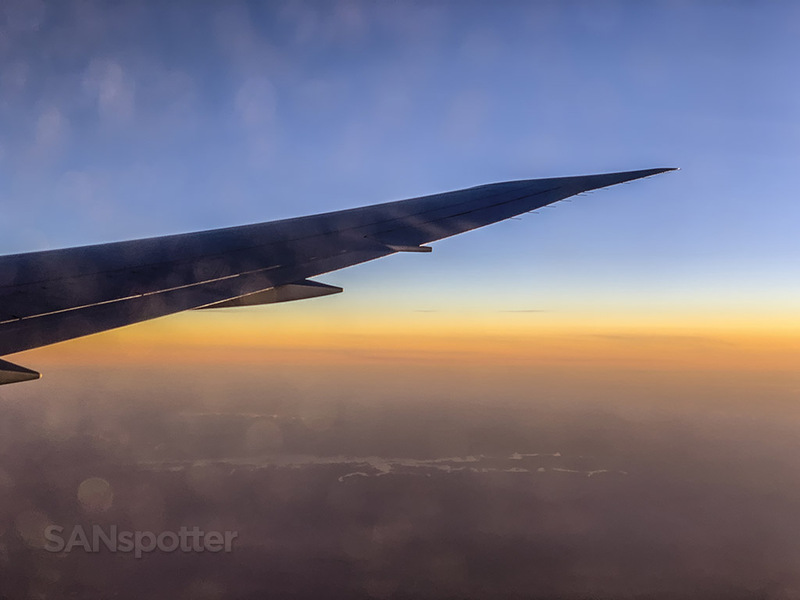 I didn’t even realize that there was one more flight to PBI that evening, so things were looking up as we dashed our way across the entirety of ATL. Running is a lot more fun when there’s no stress involved. It’s a lot less embarrassing as well. If you’re curious, we made the flight by the skin of our teeth. However, I was in no mood to be trip reporting at that point, so there will be no review of that segment. Why aren’t there more Delta widebodies at SAN? 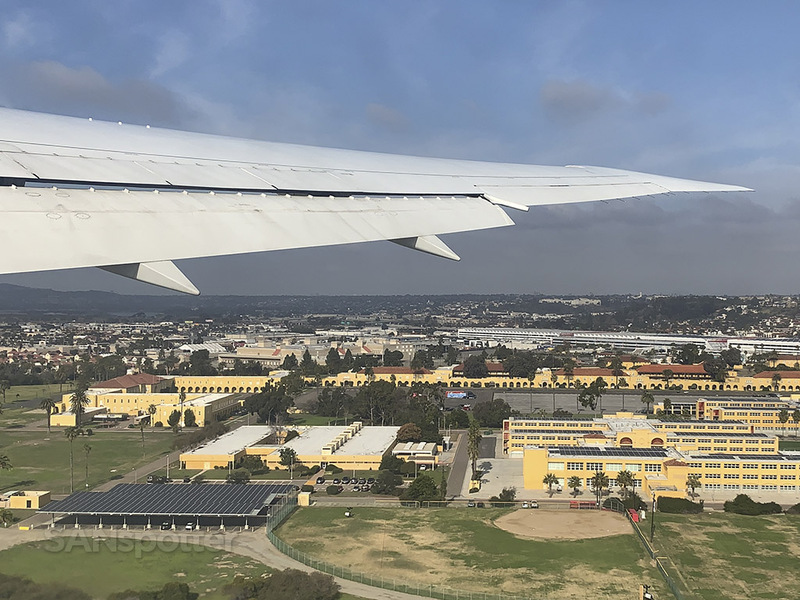 Remember when Delta used to fly multiple 767 in and out of San Diego on a daily basis? Those days seem to be long gone at this point, thanks in large part to the retirement of the domestic-configured 767–300. 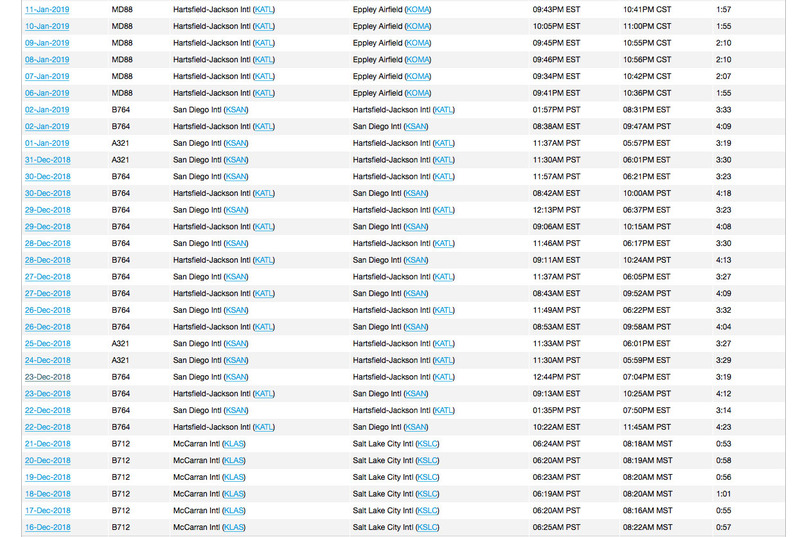 Now all we get here at San Diego is a whole lot of A321s and 737s, which makes me frown. I’ve talked a bit before about how impressive the Delta operation is here at the SAN. 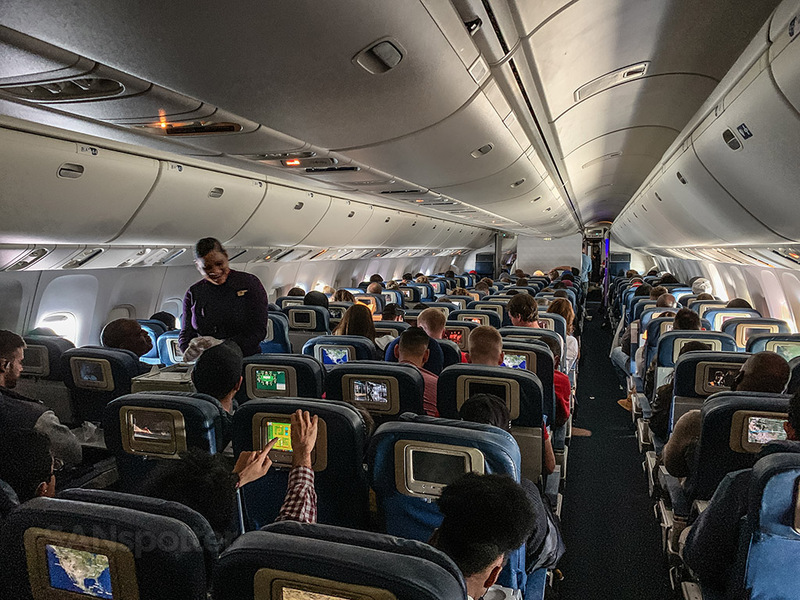 The amount of passengers they move in and out of this place on a daily basis is nothing short of impressive, and they could easily fill any size airplane that they send here. 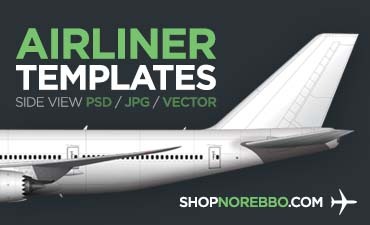 The fact that they deemed the 767-400 to be a good idea (if only for these two short weeks) is hopeful in the sense that it may mean that they will be bringing back regularly-scheduled widebody service at some point. I highly doubt we will ever have a daily Delta A350 here at SAN, but there’s no reason to believe that a daily A330 to ATL (with a proper Delta One cabin) isn’t out of the realm of possibilities. My frown will be turning upside down the day that happens. N828MH is currently in CAN for mods. It’ll be the first 764 to get D1 Suites, Premium Select, and new Economy seats. Really? 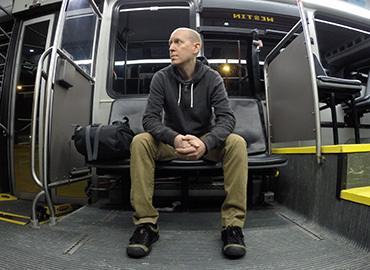 Dang it – I didn’t realize how close I was to getting a ride on a freshly configured 764! They are going to be really nice once the updates are complete though. Delta is doing really good things with their interiors, that’s for sure. Where did you get the new information on the updates of the 764. Will they be done by summer? I think I read about it somewhere on airliners.net a while back. I know that the first 764 went in for mods in late January, but I can’t recall how soon the entire fleet will be completed. It’ll likely take a year or two IMHO. I will be flying there in 2 months and I have a 45 minute connection it ATL. Will I make my 757 to SAN? 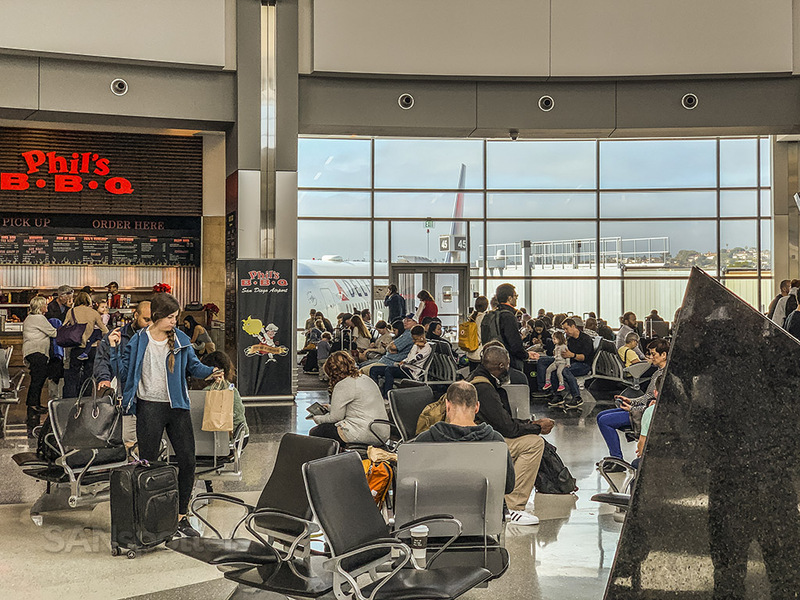 We made our 35-minute connection after arriving at terminal F and departing out of A, so you can do it if you run! It’ll be a piece of cake if you arrive and depart out of the same (or neighboring) terminals though. ATL is big but efficient. 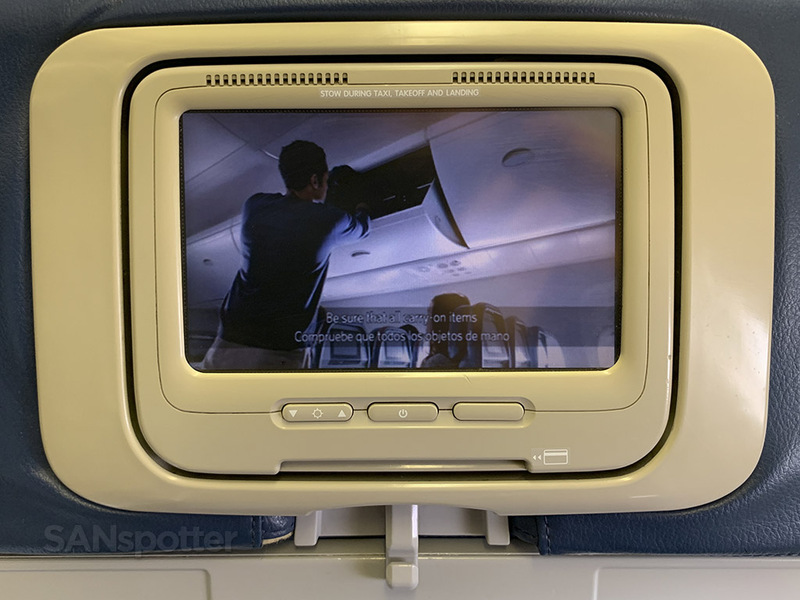 Interesting that Delta is refurbing the 767. Mainline AC is retiring all its 767s by 2019 and adding A330s. Not sure about Rouge, but I avoid them at all costs. I remember a flight with my mom and sister from YUL in the 70s. We were going to TPA or MCO (can’t remember which). Back then, there weren’t any direct flights from YUL, so we connected through ATL. I do remember the aircraft … a silver Eastern 727 “Whisperliner”. Of course, there was nothing whisperey about it, and I never got to use the back airstairs. We were late getting into ATL, but at least our connecting flight was in the same terminal. My mom was freaking out, and then a golf cart pulls up next to us. Coming from the comparatively tiny YUL, this blew me away. “Oh my gosh! It’s a golf cart at an airport!” The driver hollered at us to get in and he sped us to our gate. I thought this was the greatest thing in the world. In all the years of flying that one incident has always stuck with me. Haha, whenever I think “golf cart in an airport” it’s always ATL! So annoying…but highly convenient when in a time crunch. Sounds like some good memories – flying back in the 70s and 80s was so much different than it is now (both good and bad). Those wingtips are beautiful aren’t they? Still, after all these years, I sill think they are one of the best “winglet” designs ever.